This is a cute little chick that I totally cased from a http://inspireddesigns.typepad.com/inspired_designs/2009/04/index.html. 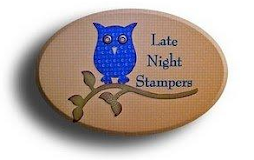 I saw it on splitcoaststampers and went to her website. I made it smaller to go around a peppermint patty. I think she is totally adorable!! I used the circle scallop punch, 3 flower punch for the feet, I cut a piece of only orange in a triangle for the beak, I used the retired boho punch for the hair and Stampin' Up's small circle punches for the eyes.